Both Stellarium Portable and X-Stellarium appear to be at v0.12.4 (on 2014-7-22) rather than the v0.13.0 mentioned in the title. If you want to try a different portable version, have a look on winPenPack site. @bassiliin: No, you just pick a directory as you normally would (full path), just be sure it's on the same drive as Stellarium Portable. As you move the app around, the path will then be adjusted by the launcher. @JohnTHaller: Still no luck. I'd like to set screenshot path like this "..\..\New things\" but it changes back to this one what was selected using "browse a folder" and it gets full absolute path. And when moving app to another drive it will select automatically "My Documents" folder. @bassiliin: Grab revision 2 which will properly update the screenshot path for you as you move around. Great app, but seems to be a bit unstable since the 0.10.x versions. Why would Stellarium post to C:\users\myname\appsdata\roaming? Not completely portable in a pure sense? But no registry entries. Noticed same thing with Firefox portable and VLC. Curious? Stellarium is neat. Any way of changing the brightness on some of those menus? Also, any else get that black diamond jumping across the screen because of the frame per second update? At first I thought it was a UFO. Personally, I preferred the old UI to the new one. can not extract the 0.10.1 installer version with 7-zip.. Unfortunately this new version force the creation of Stellarium setting folder in Document and Settings.. 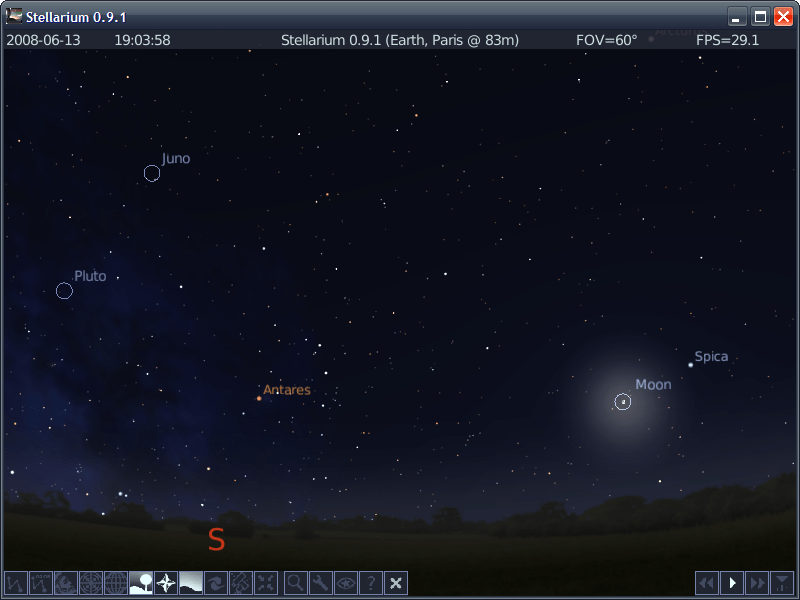 I have wrote to Stellarium developers to add this feature again in the next release.. Yes, it's not a truly portable apps as it's create the Stellarium sub-folder in the Documents and Settings folder. The application is great, but won't start standalone. Windows just reports that it encountered a problem. Works fine when installed normally, though. Thanks, Rob! New version of innounp works. Rob; thanks very much for the innounp-tip. There have been many occasions where unpacking was unsuccesfull. This works great! Which means there is a lot of great freeware from this side to be tried again. Create the Stellarium sub-folder in your user's Documents and Settings folder. I can't extract with Universal Extractor (1.5), it's Inno Setup 5.1.10. Others could done the extraction? I have used this a lot to identify the moonrise and moonset as well as for stargazing. The best software available out there with no comparison. The capability to configure it is immense. Wow!!! - Simply one of the best freeware programmes, I've ever downloaded. stella is all i hoped for years ago.. .
Amazing!. Without a doubt the best free stargazing software I've seen. And portable too. I took my laptop out into the garden and it really does match up. I also like the way the daylight fades to night if you leave it running.